This essay originally ran in 2016 and is one in a series of our most popular posts that we put at the top of our story stream for new readers. With more than 3,000 evergreen stories, we want to make sure you don’t miss the goods! Run a Google search on naturalist and preservationist John Muir and you will quickly turn up one of his best-known, yet abbreviated, sayings: “The mountains are calling and I must go.” It’s a compelling quote that says it all for many outdoor lovers, which may explain why it’s printed widely on mugs, t-shirts, posters and jewelry and paraphrased by today’s adventurers. However, the shortened quote doesn’t fully capture John Muir or his desire to understand and protect California’s Yosemite – a grand glacially cut valley with sheer 2,500-foot walls, now federally protected as one of the oldest of the Sierra Nevada’s four national parks. As we mark the anniversary of Muir’s birth on April 21, 1838, we should consider the full quote, which appears in an 1873 letter from Muir to his sister: “The mountains are calling & I must go & I will work on while I can, studying incessantly.” These words reveal a man who saw responsibility and purpose as well as pleasure in the mountains. Muir was a master observer who enjoyed the constant work of understanding nature. Letter from John Muir to Sarah Muir Galloway. As the curator of John Muir’s papers at the University of the Pacific, I help researchers to “study incessantly” these raw materials and get the full unabbreviated story. The papers reveal Muir’s determination to interpret and preserve nature, and his seminal role in the creation of the National Park Service which is celebrating its 100th anniversary this year. You too can participate in not only understanding Muir but making him more accessible by transcribing his handwritten journals. We are enlisting citizen curators to harvest Muir’s words and make his journals keyword-searchable. Of course, the payoff for the transcribers is finding their own meaningful Muir quotation. Before acting on those “every day” thoughts and going to Yosemite, Muir wanted to follow the footsteps of famed naturalist Alexander von Humboldt to South America, so he grabbed some books and a plant press, and started his “thousand mile walk to the Gulf” of Mexico from Indianapolis. However, a bout with malaria in Florida diverted his attention from visiting South America. He decided to make his way to California via steamship as quickly as possible. John Muir took copious notes in his field journals that are preserved and made available for study at the University of the Pacific. The King Tree and me have sworn eternal love,… and I have taken sacrament with Douglas Squirrel [and drank] sequoia blood…. I wish I could be more tree-wise and sequoiacal, so I could preach the green brown woods to all the juiceless masses. 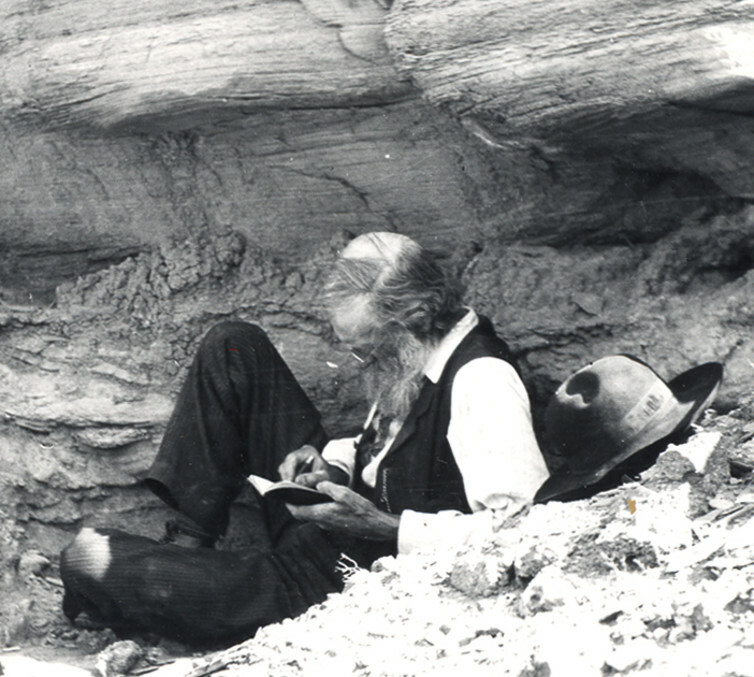 Muir used his observations to interpret the science of Yosemite and the Sierra. Before Muir arrived, California’s first geologists had theorized that Yosemite was created by cataclysmic dropping of the valley floor through violent earthquakes. But based on his studies and exploration, Muir concluded that glaciers had scraped Half Dome and carved the granite cliffs. Today geologists widely agree that glaciers were key forces in the origins of the valley. Muir also began to call for protecting Yosemite and the Sierra. He saw major threats from loggers’ axes and the livestock industry’s “hoofed locusts” – his description of sheep that were overgrazing and destroying mountain meadows. Two years after Yosemite National Park was created in 1890, he cofounded the Sierra Club to preserve California’s greatest mountain range and make it more accessible. The battle to preserve the glorious valley was lost in 1913 when Congress passed a bill authorizing the dam. The loss practically killed Muir as well, and he died of pneumonia in a Los Angeles hospital a year later. The best story I’ve ever read on Adventure Journal. It’s ironic that Muir’s words are helping hundreds of bumper sticker, shirt, mug, etc. companies profit off our wilderness but so many wear the words on their vehicles to brand themselves as “outdoorsy.” His words are more than just an Instagram caption. Hello I am the Great Great granddaughter of John Muir. My name is Ginger Smith, my grandfather Walter Muir was very inspiring to me and my sister’s growing up. We would go visit him & grandmother during the summer’s. He would take us to Yosemite and Muir Woods. I miss my Grandpa Muir very much. If you wish to more you can contact my mother Marlene Muir. She lives here in the Denver, Colorado area. She has a lot of info on my Grandpa & can share some of the family history. Thanks for reposting, Steve. I missed this first time around. Muir can’t and shouldn’t be reduced to a catchphrase. His words have always inspired me and guided me onward. I can’t think of a time when I am out photographing this wonderful world in which his words don’t stir around in my soul. As someone who has worked as a backpacking guide around the US, it pains me to hear people throw around the abbreviation. Thank you for sharing this. I live in the Smokies near Asheville. Muir’s words called to me. The need for preservation of mountain wilderness is as urgent today as it was a century ago.